Dress up your daily hydration with infused water! 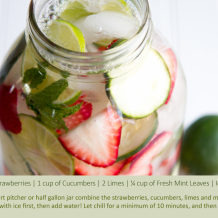 Strawberry, Lime, Cucumber and Mint Infused Water. Strawberry - Strawberries help improve eye care, proper brain function, relief from high blood pressure, arthritis, gout, and various cardiovascular diseases. They are beneficial for improving the immune system, preventing various types of cancers and reducing the signs of premature aging. Strawberries also help to protect the skin against UV damage. Cucumber - Cucumbers are full of anti-oxidants, including vitamin C, beta-carotene, and manganese. They are also hydrating which is essential for soft, supple skin. Lime – Lime provides 32% of the daily recommended vitamin C intake. It has high water content and a good source of minerals like calcium, iron, copper, sodium, magnesium, phosphorus, and potassium as well as vitamins like folate, vitamin A, vitamin E, and vitamin K.
Mint - Mint is rich in anti-oxidants and flavonoids. Mint can aid with weight loss and proper digestion, relief from nausea, depression, fatigue, and headache. It is used in the treatment of asthma, memory loss and skin care problems. Mint is known for soothing and healing inflammation and helps keeping acne at bay.